Whether celebrating a special occasion with family and friends or hosting a corporate event, Stonewood Grill & Tavern - Jacksonville can accommodate all of your special event needs. Stonewood Grill & Tavern offers a complete dining experience for both your eyes and your palate. You don’t want to have just another ordinary night out — so tonight, make it extraordinary! We oak-grill each steak to lock in its juices and enhance its natural flavors. Plus, only the freshest seafood has the honor of being prepared by one of Stonewood’s gourmet chefs. Adding our innovative wine list featuring rare selections and exceptional pairings makes Stonewood a great place for couples, friends, and coworkers, for date night, happy hour, special occasions, and holiday parties. So the next time you’re looking for the perfect night out, come to Stonewood Grill & Tavern. Always a good restaurant whether you want a large meal or just sandwiche or salads. We went for my wife’s birthday dinner. The food and our server, Allison, were very good. We enjoyed the entire experience and will definitely be back. Consistently good food and service. Should work to make periodic menu adjustments. Madi, our server was very attentive. Kitchen seemed backed up though as wait for entree was longer than usual. Stonewood was absolutely amazing! This my wife and my first time out since our daughter was born, and they made every single thing about our night special. They provided a little baby gift, champagne, and amazing service and food! Highly recommend everything about this Stonewood! Our server, Kyle, is totally one of the best servers ever. Our party of 4 ladies usually has the birthday dinners at Stonewood. We like the variety on the menu, the prices are fair, the experience is reliably pleasant. Caught up with friends over dinner and drinks; the service was great (our server, Aaron, was very patient with us gabby ladies); our food very good; the bartender made a “mean” martini - overall a pretty great evening. We have passed by this place quite a few times and decided to give it a go. We did read some negative reviews however our experience was a positive one. The food was delish! Only negative was that it is a bit noisy. We will be coming back! Great restaurant, service was a tad slower than usual but they were very busy. Love the restaurant and certainly be back. My husband & I were traveling and being familiar with Stonewood Grill in the city we lived we decided to dine here. The temperature where we were seated was very cold. We enjoyed the calamari appetizer. The Asian Chicken Salad was light and full flavor. My husband order the chicken pot pie and he did not enjoy it. Upon receiving our entrees we found it unusual that the server asked if we enjoyed the food. Having been to Stonewood Grill numerous times in the city we live I was disappointed in the service we received. My only complaint is the food was so over seasoned. I could not enjoy the natural flavor of my steak. I would suggest that their be a seasoning preference offered. The server did. It come back for a while after the first bite so I just ate what was given to me. Had reservations and were seated on time but after about 15 minutes we had to ask to get waited on. Manager took our drink order and we still waited another 15 minutes to order the main course. We’ve usually had a good experience here but this visit was really sub-par, not to mention they were not busy. My wife’s steak was dry and the chocolate bread pudding came out cold. Staff was friendly but just not on their game this night. Server kept disappearing. We had to summon other employees to get service. Once again the food was flavorful and fresh. I enjoyed the N. Y. Strip and my girlfriend enjoyed the fish. Looking forward to a return visit to Stonewood soon. Always a great experience! They were busy but with my Open Table reservation we sat immediately. Great food and the best service. A fantastic steakhouse , went for a birthday and after our meal I'm happy to say we will keep this in mind on any special occasion,,,, thanks for having us and again great job ! This is the second time I've visited Stonewood Grill that the food was not up to par; it was TERRIBLE!! And both times I visited Stonewood, I've had to return the food for tasting bad! This time I ordered the fried shrimp and how in the world you can ruin fried shrimp, is beyond me. It tasted like the breading was dipped in something that had vinegar mixed in with it. Yuck!!! I sent it back and ordered the French dip roast beef, which was so so. The only thing I have to say good was that we had a very nice waitress, who did a great job of taking care of us. However, I doubt that I'll be going back there for a LONG time. Everything was excellent. Our waiter - a young man - was not the best. He talked a lot and really did not listen as he should. We went to this location when spending the night in Jacksonville. We had a reservation, but had to wait about ten minutes for a table. The hostesses seemed a bit flustered. Our waitress was very nice, but she didn't check on us often and didn't keep the iced tea glass full. I had their ginger soy marinated salmon and it was delicious. I substituted mashed potatoes for the Asian slaw, and they were just ok. I should have stuck with the slaw. The best part of the meal was their seasonal dessert. It is a four layer orange cake and it was so good! You don't often see an orange cake on a dessert menu. I think they should keep that on their permanent menu! Seated early and staff was very attentive, friendly and efficient. Met and satisfied our expectations. Food was perfectly cooked, service was spot on. We ate in a booth in the bar and it was a cozy atmosphere. 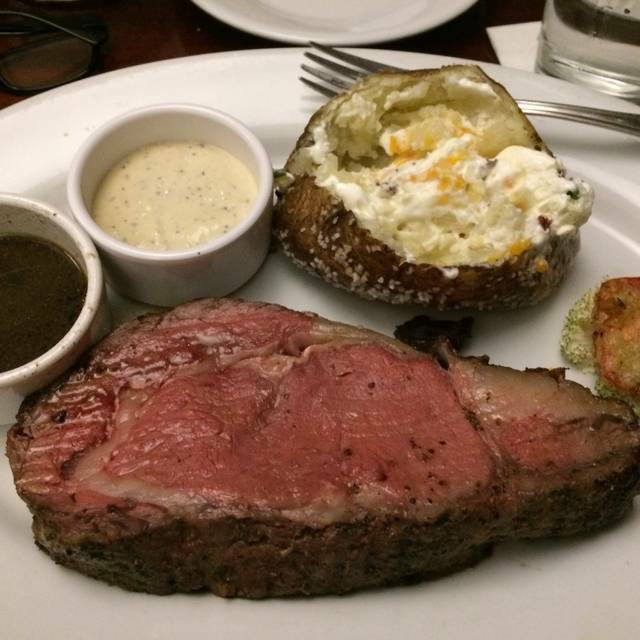 Prime rib was a little overdone but the rest of the food was great. Bruschetta was very good. One member of our party received their order incorrectly and was quickly handled although it came back still not done. They took the meal off the bill even before the order was returned. The member refused to finish the steak. She was also offered a different item or a desert. Not accepting the offer they also gave her a coupon for a free bruschetta the next time she visits the restaurant. The waitress was exceptional throughout the situation. Staff are by far the best asset at this location. Always great service. I wish they’d change the menu more frequently. Otherwise always enjoy the environment. Especially the bar area. Food is generally consistent. At times, infrequent, there is an off night with food quality. I suspect different folks on the grill. First of all, the food is very good. I'd question the management as there was not enough servers working when we arrived Saturday night. The inexperienced hostess at the front blamed the lack of a table on a server not showing up for work. Thats management's fault, not mine. POOR EXCUSE.Good restaurants are always ready for this eventuality and respond appropriately to solve the customer's needs. Seems like they need new staff at Stonewoods. I won't be back for a long time! Wonderful food and presentation, and polite and knowledgeble staff. Emerald was a fantastic server. She made our dining experience exceptional. The food was excellent as always. Can’t praise this restaurant enough! Excellent meal. Good taste and temperature. I had the grilled Mahi Mahi with Mediterranean topping (recommended by the waitress) which was outstanding. Good atmosphere, not noisy. Would definitely eat there again. Our group of 4 was seated just a few minutes after our Friday night reservation. We enjoyed a round of Happy Hour bargain cocktails and each of us ordered a different meal. All were very, very tasty and served together. One small item that is appreciated is the assortment of breads that are provided with the meal. Waitress forgot to place our dinner her order we had reseveratations at 630 dinner arrived at 8pm after we asked. They comped us around of drinks. We were so embarrassed as we brought 3 family members from Montana. We left at 9pm. Food was great... Service was bad so sad I will be calling the manager tomorrow! Great atmosphere, food and exceptional service. Also, Great bread. I would recommend to anybody. Thanks Alison for great service. The only reason the score wasn’t higher is that there seemed to be a delay in getting the food out. The appetizer was cold by the time we received it and we were halfway through with our dinner before my mother received her sandwich. Several people came by to check on whether it had been delivered and yet there was still a delay. Otherwise, the food was good,convenient location, good service. The restaurant was very busy and it seemed like there was a shortage of staff. My waiter appeared to be very rushed. Wasn’t a big concern but not what I have been accustomed to in the past. Also my absolute favorite blue cheese chips were overcooked. Not as good as I have had in the past. Everything was delicious. The appetizer was fabulous. The drinks were perfect. We had the orange cake for dessert. Incredible!! Really poor experience Friday night. Been going to Stonewood for years with pretty good success. 2 hours and 40 minutes to get served and to eat! Really? Apparently kitchen was backed up, and our server had no explanation, did not check on us much, and did not know how much longer. When we did get food the order was wrong. WOW!! 5 Very dissatisfied customers. Manager came by at the end, but too little too late! Great atmosphere. Delicious warm bread sticks (dip 'em in mustard for a real treat. Excellent Vegan plate. Excellent Salmon dinner for the Bride. Nice drinks. Will be back as usual soon. See you there! Great meal as usual. I have never been disappointed at Stonewood.